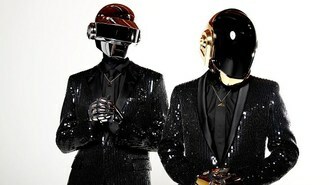 French duo Thomas Bangalter and Guy-Manuel de Homem-Christo famously perform in robot helmets and have never revealed their faces in public. "We're like regular blokes," Guy-Manuel said. "I think people are really more excited to see the robots than they would be to see ourselves," he added. "It's like C-3PO or Chewbacca. I'm a big 'Star Wars' fan but I never wanted to find out who was behind [the characters[. And if I did it right now, I would forget his face. It would not interest me. The robots are far more trippy and opening your imagination than my face or Thomas' face, and the way we live, which is not even a crazy celebrity lifestyle." Their plan is for their music to be known, while their personalities and personal lives are not. "People seem really to get it," Guy-Manuel said. "We've been doing that for a while and everybody approves apparently. The star system, the idol, the cult of personality is not the only way to be in entertainment."